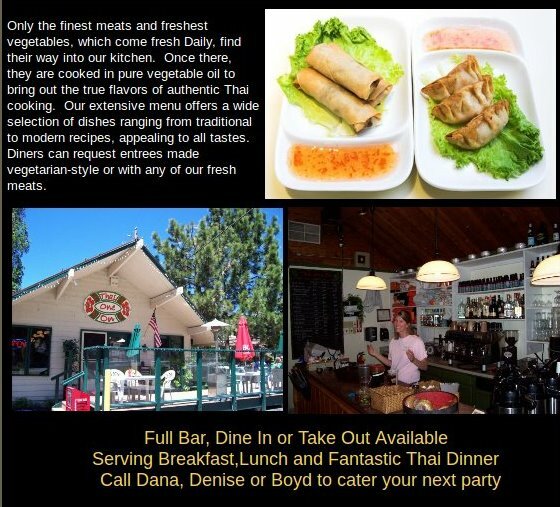 Stateline, NV…Since 2004 “Thai One On” has been the place to go for great Thai food. They serve only the finest meats and freshest vegetables, which come fresh Daily. They are cooked in pure vegetable oil to bring out the true flavors of authentic Thai cooking. Their extensive menu offers a wide selection of dishes ranging from traditional to modern recipes, appealing to all tastes. Diners can request entrees made vegetarian-style or with any of their fresh meats. Hours Tuesday-Sunday 7:00 AM to 9:00 PM. Monday 7:00 AM to 2:30 PM.